China is likely to buy more of the animal feed ingredient from the United States, even after tariffs. That’s despite government assurances it can diversify away from more than $12 bln of annual U.S. purchases. Markets sense it coming; others might soon see through bluster too. Soy beans are seen at a Grobocopatel Hermanos company storage plant in Carlos Casares, Argentina, April 16, 2018. Picture taken April 16, 2018. A ship carrying nearly 70,000 tonnes of U.S. soybeans entered the Chinese port of Dalian on Aug. 11, according to Thomson Reuters Eikon shipping data. The vessel arrived in the area more than a month earlier, shortly after the imposition of retaliatory tariffs. China imposed tariffs on $34 billion of U.S. imports, including autos, soybeans and other agricultural products, on July 6. 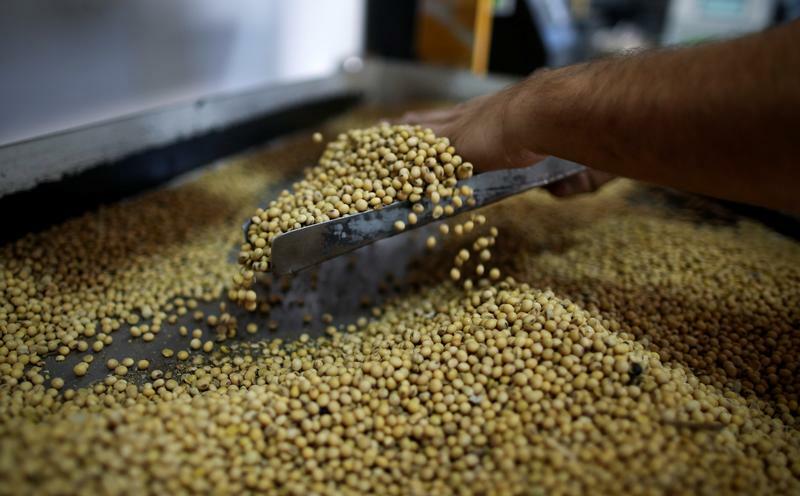 China may need to start purchasing U.S. soybeans in the coming weeks as other countries cannot produce enough to meet its demand, analysts at Oil World said on Aug. 7. Soybeans were the biggest U.S. agricultural export to China in 2017.